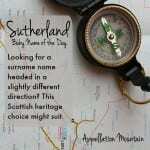 Looking for a surname name that’s less common than Hunter or Mason, but still very much on trend? Here’s one that works. 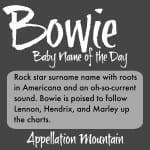 Thanks to Sarah for suggesting Haddon as our Baby Name of the Day. 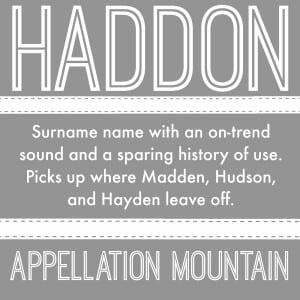 Like so many surnames that seem ready-to-wear, Haddon is surname from a place name, straight out of England. The second syllable means hill. The first part could come from an Old English personal name: Headda, recorded in the sixth and seventh centuries. Or possibly it means heath, or hill covered in heather. There’s more than one Haddon in the UK, and more in Australia and the US – though some of the American place names owe their existence to a single family. New Jersey includes both a Haddon Township and a Haddonfield. Credit London-born Elizabeth Haddon. Her father purchased five hundred acres in the colonies. They were Quakers, and searching for a home that offered religious freedom. Poor health prevented Elizabeth’s father from ever making the trip, but Elizabeth came to the colonies in 1701. She married a Quaker minister, and they built a meetinghouse. The community grew, and by all accounts, both Elizabeth and her husband were capable stewards of their considerable property. They had no children, but raised Elizabeth’s nephew, Ebenezer Hopkins, as their son, and he inherited the Haddon estate. The story of a young woman setting out for the New World on her own is an appealing one. Suffragette and journalist Lydia Maria Child wrote an account of Elizabeth’s life in 1845. Henry Wadsworth Longfellow referred to her in a poem. Perhaps the most famous bearer of the given name Haddon was early twentieth century illustrator Haddon Sundblom. 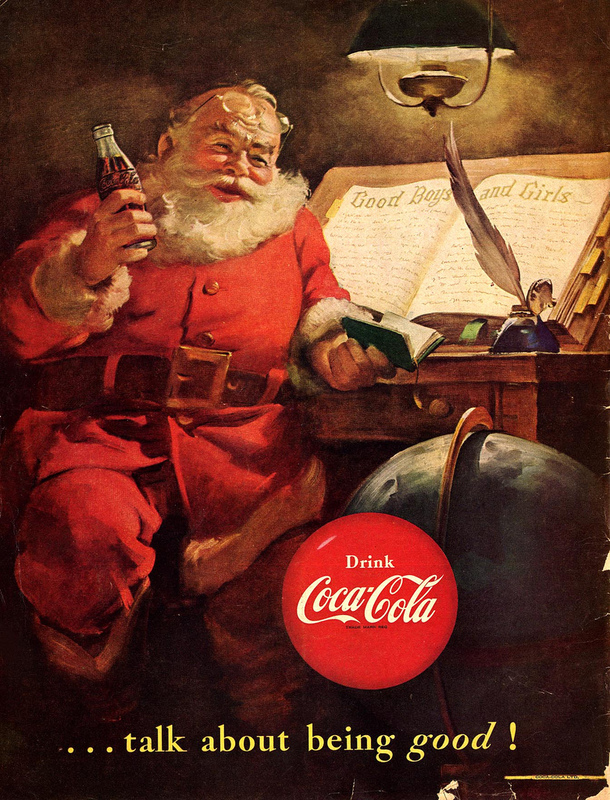 Among his most famous creations for the Coca-Cola company? His 1930s version of Santa Claus. Sundblom’s illustrations shaped the way we see the jolly old elf. 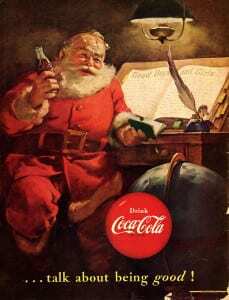 Sundblom illustrated Santa Claus for Coca-Cola over more than three decades. His plump and pleasant version of Saint Nicholas has become the standard image in much of the world. He’s considered a major contributor to twentieth century advertising art. Parents considering the name today probably aren’t thinking of the early settlers of New Jersey or Santa Claus. Madden, heavily associated with football thanks to player-turned coach-turned commentator-turned wildly successful video game series, John Madden. Hayden, falling with all of the rhymes-with-Aiden names, but still popular. Ends in -den and – don names remain popular, from literary Holden to place name Camden. And, of course, Landon and Brandon have both been in the US Top 100 for years. 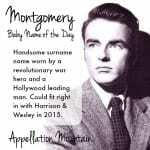 In general, two syllable, ends with -n has been the go-to formula for a popular boys’ names in recent years – think of Mason, Ethan, Hudson, Jackson, Colton, Easton and countless others. H surname names are doing well for girls, from Harper to Hadley. Haddon feels like one that might be reserved for the boys. No surprise then, that Haddon is quietly on the rise. In 2000, there were seven newborn boys with this name. By 2014, there were three dozen. Alternate spelling Hadden is sometimes seen, too. If you’re after a rarity with an on-trend sound, Haddon might be just the name for you. 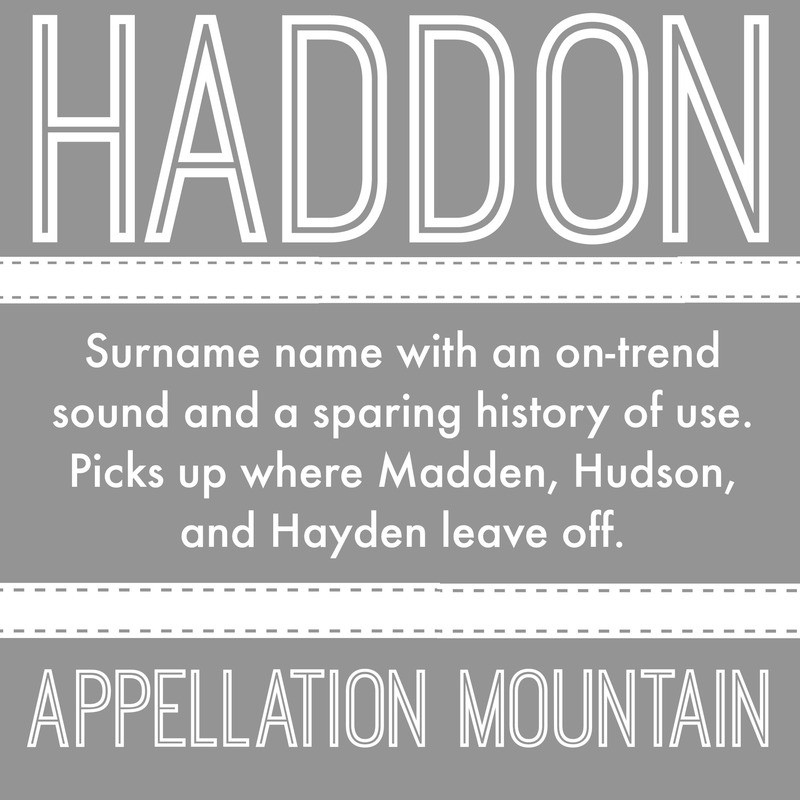 What do you think of Haddon as a given name? Does it feel fresh and interesting, or is it too close to Madden-Hayden?